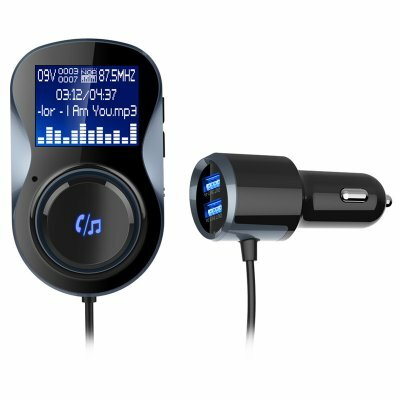 Successfully Added Car MP3 Player - Bluetooth Hand-free, Dual USB, Voltage Detection, FM Transmitter, TF Card Slot to your Shopping Cart. Connect this Bluetooth Car FM Transmitter with your car redio frequency wirelessly and it has a big rotary key to achieve a variety of operations. 1.4inch big screen display to show song name, voltage display, caller ID to ensure traffic safety, allowing you to freely view without pressure. Dual USB port to distribution of current, so that a substantial increase in charging efficiency, while mobile phones, tablets and other charging time calmly grasp. Download your favorite music in advance, keep the car redio frequency and product frequency same, open the phone music to play. with 6 kinds of safety protecion to be safer, work for 12-24V car models, whether it is cars, trucks, off-road vehicles can be used. If TF card insert, the product automatically switches the TF card mode and play the card's music to let you enjoy your music immediately. 360 degree rotary holder will make you freely rotate in all directions to achieve a more comfortable viewing angle.